Wellworks For You is committed to staying up to date and involved in current research on significant health topics. One such topic is the issue of health hazards associated with cell phones. In fact, many studies have now been conducted to examine the correlation between cell phones and health concerns or risks. Do they cause brain tumors? 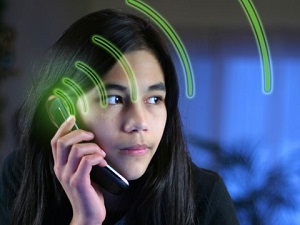 Are cell phone users experiencing radiation? Is any cell phone really safe? Since millions of people around the world use cell phones on a daily, if not hourly basis, this is a real issue that needs to be examined. The presence and use of cell phones has led to concerns about their effect on emotions, individual’s stress levels, possible risks of illness, chronic pain, immune system health, and even vision problems. Though the body of research is not complete and definitive conclusions have yet to be drawn, many studies are beginning to lean towards the answer that there really may be some serious and consequential links between cell phone use and certain health concerns. We understand that this issue is an important aspect of overall wellness. To protect yourself from any potential health hazards, follow our 5 tips for using your phone wisely. Regardless of whether your cell phone is emitting radiation or not, talking or texting on your phone while driving is a serious hazard to your health as well as to the wellbeing of drivers around you. Studies have shown that texting while driving is actually worse than driving while drunk. You cannot possibly focus on the road and your cell phone screen at the same time. If you can’t handle the temptation, put your phone in the backseat or the trunk until you get to your destination. You can also use programs like DriveSmart, which essentially block texting ability until you arrive safely where you want to go. Use a headset while driving. Many states won’t allow you to use a handheld device while driving anyway, so this is a win-win situation. Follow the law and guard against any possible side effects at the same time. Bluetooth emitters help reduce the amount of radiation the brain is exposed to. You can also put your phone on speaker so that you don’t have to hold it against your ear to talk. Try to make it a habit to, whenever possible, move the phone away from your head. Your phone’s speakers will pick up on your voice, so you can even put the phone on a surface near you when in use. Researchers especially emphasize keeping cell phones away from children. This includes pregnant women holding the phone near their torso or teenagers who want to sleep with their phones under their pillow. In order to minimize the potential risk associated with cell phone radiation, you can purchase a device with a low SAR rating. SAR stands for Specific Absorption Rate. This is a measure of the strength of the magnetic field that is absorbed by the body. Low SAR cell phones will reduce your exposure to radiation. If you’re sitting around at home or settling in for a long conversation, use your landline instead of your cell phone. Researchers recommend using your cell phone for brief conversations, texting whenever possible, and using your landline for conversations longer than a few minutes. Cordless phones also emit radiation like cell phones, so try to use a phone that is plugged into the wall. It may seem old school, but it can help prevent future health concerns. Having a landline can also serve as an emergency backup should a cell tower nearby or electricity in the house ever go down due to technical issues or storms. If you see the signal on your phone is weak, try to avoid using it until you are in an area where it is strong. When the phone is either moving (like in a car) or searching for a signal, the power is increased to maximum in order to find a new relay antenna. The weaker the signal is, the more your phone has to boost the radio frequency in order to get or stay connected. This increases your radiation exposure. Though studies are still being done, cell phones and health hazards are quickly becoming linked in a variety of ways. Follow our 5 tips to use your cell phone wisely and reduce the potential for future health issues associated with phone use.